Since the 1960’s, the American M109 had dominated the market in Self-propelled gun’s. Over 25 countries in the world had used it. These included Great Britain, Germany & Italy who had been looking for a replacement. Both Germany & Great Britain had entered into another joint development, the PzH 155 aka Sp-70, which like many other joint developments, it was ended in 1986. The British went with Vickers GBT 155 project, which had built two prototypes by 1986 which went onto become the AS-90 and Germany went looking for an indigenous design. The former German company Wegmann (now Krauss-Maffei Wegmann) developed the chassis, which shared some components similar to the former Leopard 1 Tank and also a new turret. The company headed a consortium of German manufacturers. The highly successful German gun manufacturer Rheinmetall, (who had built the lengendary L44 tank gun as used on the M1A1 & A2 Abrams Tank and Leopard 2) developed the 8 meter long, 155mm, Calibre Length 52 Main Gun. The Pzh 2000, aka The Panzerhaubitze 2000 (“armoured-howitzer 2000”) was accepted into service with the German Army in 1995 who ordered 185 of them, with delivery of the first few completed vehicles in 1998. In 1999 Wegmann merged with Krauss-Maffei, another successful German arms manufacturer to become Krauss-Maffei Wegmann, who are now the prime contractor for the vehicle. They are responsible for construction of the turret and systems integration, whilst Rheinmetall landsystems are responsible for the construction of the chassis. The Cal Length 52 (L52) main gun has a firing range of up to 30km with a standard round and 40km with a rocket-assisted round. The Pzh 2000 has one of the fastest rate of fire of all modern Self-propelled gun’s at 3 rounds per 10 seconds, 8 to 10 rounds per minute, 20 rounds per 3 minutes. This is achieved through its automatic primer magazine that can carry 60 rounds and automatic inductive fuse setting. The charges are loaded manually. The entire loading, laying and clearing is completely automated. The Pzh 2000 carries all the latest digital fire control technology. It uses GPS to position the main cannon, direct data links to a ‘behind the lines’ fire control command post, so it can complete fire missions quickly, independently or the fire control command post can enter this data. 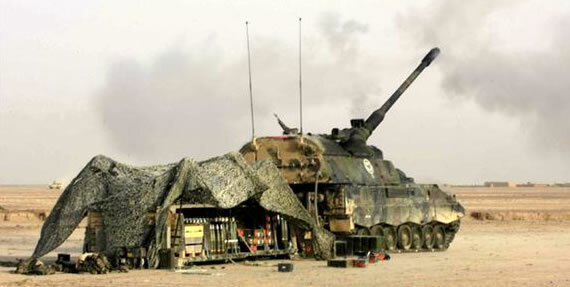 Like most Self-propelled Howitzers, it is lightly armoured. The crew is protected against small arms fire up to a caliber of 14.5 mm, 152mm artillery shell splinters and roof protection against Bombletmunition. In addition it has an NBC overpressure system. It is equipped with smoke grenade dischargers, a MG3 7.62mm MG and can be additionally fitted with ERA on the turret. The MTU 881, 1000hp 8-cylinder supercharged diesel engine gives the PzH 2000 a maximum speed of over 60 km/h and operational range of 420km. Croatia: 12 “reset” second-hand vehicles to be delivered between 2015 and 2016. Germany: 185 purchased. 154 in active service with 31 in storage. Italy: 2 received from Germany for trialls (then retired) and 68 licensed build by Oto Melara in Italy. Netherlands: 57 purchased. 18 in active Dutch Army service, 33 in storage and 6 used for training. Qatar: 24 vehicles ordered in 2013. The German PzH 2000 Self Propelled Gun has been very successful on a number of operations and battles in the former Afghanistan War with the Royal Dutch Army since mid-2006, notably in Operation Medusa in the Kandahar Province, also in the Uruzgan Province and in 2007 in the Battle of Chora where it earn’t the nickname “the long arm of ISAF”.